The current conventional treatment is to slow the progression of the disease. Blood pressure control medicine, Angiotensin inhibition and fish oil are normally used. In some patients, Immunosuppression drug is also introduced to treat the underlying inflammatory disease. We have treated many patients presented with macroscopic hematuria, many of them lived in then remote rural area and never had enough finance go to bigger hospital for accurate diagnosis. The following cases selected are those who had previously been diagnosed and treated by the bigger modern hospitals in the country. Clinical history: In July 1993, the patient was hospitalised due to macroscopic haematuria, he was treated with steroids and antibiotics, but he didn’t respond to the treatment. His doctor suspected the patient had IgA nephropathy. On August 1994, renal biopsy showed one glomerulus fibrosis ( out of 11 glomeruli ) and proliferation of mesangial regions. No crescent formation. Immunofluorescence microscopy revealed the presence of granular IgA deposits in mesangial area, staining for IgM , IgG, C3 were negative. Pathological diagnosis: IgA nephropathy. On the 9th of March, 1995, his urinalysis showed proteinuria 2+. Urine microscopy showed RBC 2+ and WBC 2+. The patient was prone to colds and flu, often causing sudden onset macroscopic haematuria. On the 2nd of May, 1995, he started our TCM remedy therapy. On the 15th of May 1996, his urinalysis showed proteinuria negative. Urine microscopy showed RBC negative, WBC negative. He continued the therapy for one more year, he had no further relapses following the completion of our TCM remedy therapy. Today the patient is healthy, he is married with two children aged 4 and six months. Clinical history: The patient was hospitalised twice due to severe proteinuria and macroscopic haematuria. Initially he was treated with steroids 55mg/day and other medicines, but he didn’t respond to the treatment. He remained on the high level of steroids, unable to taper off. 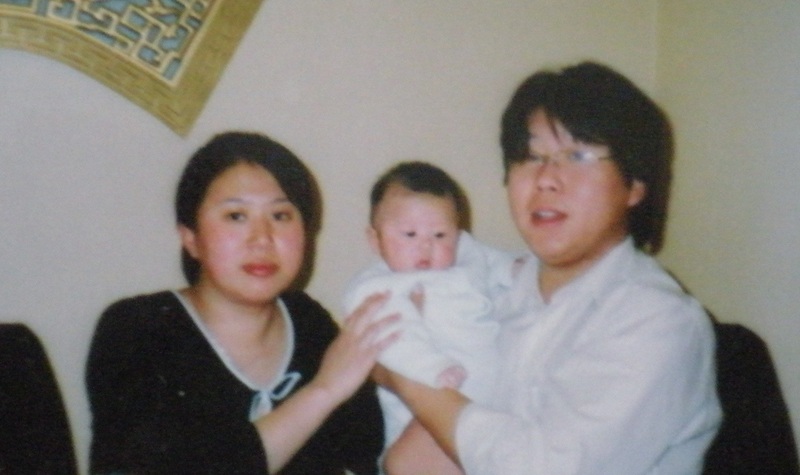 His parents didn’t want to subject him to a renal biopsy. He was diagnosed with Nephritis Nephropathy by the Beijing Friendship Hospital Kidney Specialist. His laboratory tests showed ESR 43mm/h, BUN 15mg/dL, CHOL 307mg/dL, TP 4.0mg/dL, serum albumin 2.11mg/dL, hemoglobin 1.89mg/dL, the urinalysis showed proteinuria 0.3g/24hr, urine microscopy showed RBC 4+. In February 1989 his parents wanted try our TCM remedial therapy. One year after taking our TCM remedies, he was clear of steroids. His laboratory tests showed his ESR decreased to 2mm/h, BUN decrease to 0.5mg/dL, CHOL decrease to 152mg/dL, TP rose to 7.8mg/dL, serum albumin rose to 5.2mg/dL, haemoglobin 2.6mg/dL, his urinalysis showed proteinuria 0.15g/24h, urine microscopy showed RBC negative. He continued our TCM remedy therapy for one more year to consolidate the treatment. In 1997 he enrolled in college. His laboratory tests and urinalysis tests were normal. The photo on the left was taken in 2006. The patient with his wife and his new born baby boy, also healthy. In December 2009 when she came to our clinic, her urinalysis showed urine protein excretion 1.7g/24hr, urine microscopy showed RBC 2+, her routine blood tests showed the kidney and liver function were normal. She was on steroid and BP medications. She started our TCM remedy therapy on 12/12/2009. Three months later she was cleared of steroid and BP medications, urinalysis tests showed haematuria negative, proteinuria still positive. On 21/07/2010, the urinalysis showed urine protein excretion had decreased to 0.168g/24hr. She continued to take our remedies for a further 6 months. Today she is free of haematuria and proteinuria. The above patient initially didn't believe our remedies can help her to be free of haematuria and proteinuria. She refused to come to our clinic after her mother received an recommodation from another patient. It took four months of persuasion from her mother that she finaly agreed to give it try.